Bob Hope: [Closing remarks, referring to Martin Luther King, Jr] The Man from Montgomery and today's young filmmakers have much in common. They, too, have a dream. Almost perfect attendance in the four acting catagories!! Apparently, out of the 20 nominated performers for the four acting catagories, 18 showed up. The missing two were Spencer Tracy, as he was dead, but was represented by his widow and also missing was Katharine Hepburn, who was in Los Angeles that night, but did not want the public to see her face, in case she lost the award. Poor baby!! What can one say about the nominees and the winners for this year. Horrible!! 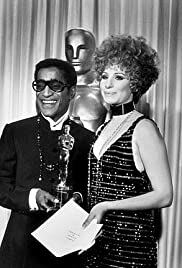 "Doctor Doolittle" was nominated for Best Picture instead of "In Cold Blood", Paul Newman loses Best Actor to that hammiest of actors, Rod Steiger and Katharine Hepburn win Best Actress out of sympathy because of Spencer Tracy dying. Any of the other four actresses nominated would have been a better selection. But not all was lost, after all Alfred Hitchcock received the Thalberg Award, still it would have been something for Mr. Hitchcock to have received an actual Oscar in his lifetime, but I am not arguing on this one.